For security devices, calculators, wearables, glucometers, and more. 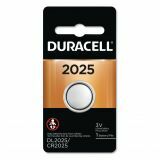 Duracell Lithium Coin Battery, 2025 - Lithium Security Batteries are designed for use in electronic organizers, cameras and camcorders. Coin-size batteries have 3 volts.